The Hepatitis B Foundation (HBF) is joining the Africans for Improved Access (AFIA) program at the Multicultural Aids Coalition (MAC), the Coalition Against Hepatitis for People of African Origin (CHIPO), the New England AIDS Education and Training Center (NEAETC), and the Harvard University Center for AIDS Research (CFAR) in continuing the national fight for federal recognition of National African Immigrant and Refugee HIV and Hepatitis Awareness Day (NAIRAHHA). Founded during one of the African National HIV Alliance’s (ANHA) strategic planning summits, NAIRAHHA Day has been observed annually on September 9th by healthcare professionals, awareness campaigns, and other organizations since 2014. This year, NAIRHHA Day commemoration began on September 1st. Quotes collected from #justB storytellers, healthcare providers, and health educators are currently being circulated across social media accounts to start a virtual conversation. The hashtags #StigmaCantWin and #NAIRHHADay2018 are being used to organize the discussion and raise awareness on Twitter. The quotes are centered upon addressing stigma and myths surrounding HIV and hepatitis in African immigrant communities. Some quotes remind viewers that despite how it may feel, many reliable HIV and hepatitis B resources are present around the country. Other quotes – like this one from #justB storyteller Bright – offer words of encouragement and support to those who may feel alone. 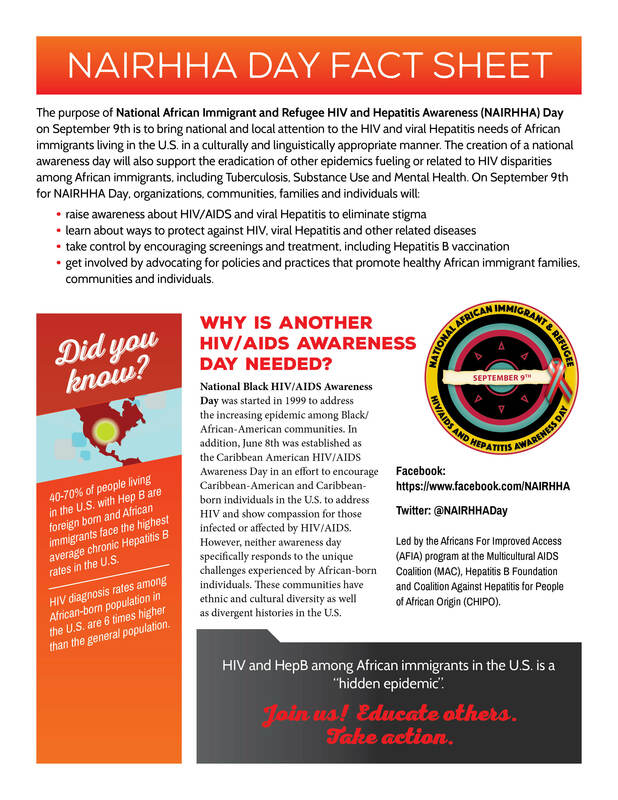 A comprehensive webinar, titled Stigma Can’t Win: HIV and Hep B Among African Immigrants, will take place on Wednesday, Sept. 20 from 3 p.m. – 4:30 p.m. and will complete the commemoration of NAIRHHA Day 2018. You can register for the webinar here. In addition to stigma’s impact on access to care and screening for HIV and hepatitis, viewers will learn about the root causes of these particular stigmas and how prevention-related stigma differs from the stigma of living with a certain disease. These topics are essential to the process of global eliminating viral hepatitis by 2030 – a goal set by the World Health Organization (WHO). Healthcare providers and community members will share their experiences with the audience during this interactive webinar. Advocating for policies and practices that promote healthy African immigrant communities, families, and individuals. Last year, the Hepatitis B Foundation launched a project in partnership with CHIPO and the Centers for Disease Control and Prevention (CDC) to raise hepatitis B awareness among African immigrant communities. The project seeks to improve hepatitis B awareness, linkage to care, screening rates, and vaccination rates. The first phase of the project, which was completed in 2017, assessed the needs of African immigrant communities – including cultural beliefs, religious beliefs and common barriers to accessing healthcare. The second phase is currently underway and focuses on the development of educational materials to be disseminated amongst community leaders and healthcare professionals to further their understanding of both hepatitis B and the needs of the specific communities they are working with. Materials are anticipated to be released in early 2019. Ending stigma and bringing attention to these issues doesn’t only start with coalitions and organizations; it also starts with YOU! Everyday actions can help to increase the visibility of HIV and hepatitis B, and encourage others to speak up. Below are some tips for individuals on NAIRHHA Day – or any day! Start a conversation in real life: Take the information that you see and talk about it with your friends, families, and co-workers! Know your facts: Don’t have a lot of time to read? Fact sheets like this one for NAIRHHA Day provide brief, but informational summaries of why a cause is important! HIV and hepatitis infographics are also available on the CDC website and the Know Hepatitis B campaign even has short videos and free posters so you can pass the knowledge along! Share what you see: Social media may seem trivial at times, but it can help spread the message. Retweet, like, and repost the quotes you see or any information that can help combat stigma! Help get NAIRHHA Day federally recognized: Contact your local health departments, local and national HIV and hepatitis organizations, and the HIV.gov Team at @HIVGov and express the need for NAIRHHA Day!